On Marine Parade at Hunters Quay and Kirn there are two cast iron drinking fountain canopies. Although the canopy at Kirn has been restored both structures have lost original elements. The structure at Hunters Quay is situated at James Street near Jim Crow Rock. Three of four medallions are missing and the fourth contains a dedication shield. Only two of four original griffins remain, and the space beneath the canopy where the font once stood is empty. The Kirn fountain is located between Kirn Brae and Stewart Street. Photographs of the original structure show elements that are now missing such as griffins on each corner of the canopy, the finial at the top of the dome, and the font which has been replaced with a planter. A dedication plaque states, The Gift Of / The Directors / Of The Kirn Pier / 1877. Within an image from 1899 the font beneath the canopy is #7 with a dog trough at ground level. Lion head medallions are visible and the structure terminates in a gas lamp finial. By 1903 the font has been replaced with an enclosed pillar model. The gas lamp holder no longer exists in 1907 and has been replaced with what appears to be the model of an owl. One of the lion medallions is missing. Pictorial evidence between the years of 1907 and 1938 identifies that the structure remained to have a pillar font with owl finial atop the dome. These drinking fountains, customized from design number 8 in Walter Macfarlane & Co.’s catalogue, were manufactured at the Saracen Foundry at Possilpark in Glasgow. The structure is 9 feet 6 inches high and consists of four columns, from the capitals of which consoles with griffin terminals unite with arches formed of decorated mouldings. Rope moulded cartouches within each lunette host a lion mascaron and a dedication shield. On two of the sides provision was made for receiving an inscription using raised metal letters; whilst on the other two sides was the useful monition, Keep The Pavement Dry. Civic virtues such as temperance were often extolled in inscriptions on drinking fountains. The structure is surmounted by an open filigree dome, the finial was a gas lantern. Under the canopy stood the font (design number 7) 5 foot 8 inches high. The terminal was a crane. The basin (2 feet 6 inches in diameter) which has a scalloped edge and decorative relief was supported by a single decorative pedestal with four pilasters and four descending salamanders, a symbol of courage and bravery. A central urn with four consoles offered drinking cups suspended by chains. The fountain was operated by pressing a button. A cast iron structure located just inside the War Memorial gates on Finborough Road was purchased as a memorial to past students who gave their lives during the First World War. The drinking fountain was installed in the Recreation Ground opened on 1 May 1920 by Mr. George Ormes, chairman of the Stowmarket Urban District Council’s War Memorial Committee. In 1961 Queen Elizabeth II’s visit to Suffolk included an exhibition of local industry, arts, crafts and agricultural produce in the Recreation Ground at Stowmarket. To provide ease of access to the Queen’s vehicle the fountain was moved to the western corner of the park. It was not returned to its original location until 2007 following restoration of the structure. The drinking fountain was recorded as a Grade II historic listed building on 20 February 2017. The 6’ 2” drinking fountain, design number 18, was manufactured by Walter Macfarlane’s Saracen Foundry in Glasgow, Scotland. Seated on a two tiered square plinth, it has a wide base in the form of a St. Andrew’s cross with canted corners, on which is set a circular shaft ornamented with water lilies. Four lion jambs support four highly decorated quatrefoil basins. Three sides of the central obelisk contain swan and bird relief. The fourth side contains a dedication; This Drinking Fountain / Was Presented / To The Town Of / Stowmarket / By The Children Of The / Adjacent Senior Council / School In Memory Of / Those Old Scholar s/ Who Made The / Supreme Sacrifice / In The Great War / 1914-18. A kylix-shaped vase terminal with four consoles originally offered drinking cups suspended by chains. Symbolism was popular in Victorian times. Griffins are symbolic of guardians of priceless possessions; lions are symbolic of guardianship; owls are symbolic of guardians of the afterlife, and eagles represent immortality. On August 14, 1923 the Cenotaph was unveiled at the intersection of Main and Church Streets. This memorial replaced a cast iron drinking fountain erected in 1867 to mark the completion of the Water Works in 1866. The drinking fountain which was relocated to the green opposite St. Rose’s High School in Church Street, just a few hundred feet from its original location, no longer exists. Rope moulded cartouches within each lunette hosted the image of a crane, and an open bible displaying a verse from St. John’s Gospel chapter 4 verse 14, ‘Whosoever drinketh of this water shall thirst again but whosoever drinketh of the water that I shall give him shall never thirst,’ or optional memorial shields. On two of the sides provision were made for receiving an inscription using raised metal letters; whilst on the other two sides was the useful monition, Keep The Pavement Dry. Civic virtues such as temperance were often extolled in inscriptions on drinking fountains. The structure was surmounted by an open filigree dome, the finial being a crown with a pattée cross. A second cast iron drinking fountain is located in the Promenade Gardens. A dedication plaque states; Presented / to the city / of Georgetown / by / Mrs. L.C. Probyn / 1882. The fountain is design number 13 by George Smith & Co. manufactured by the Sun Foundry. The base is in the form of a compass cross with canted corners. It has a central pedestal and four columns decorated with diamond frieze and nail head molding which support the font. The large basin has nail head relief on the rim and is partitioned by four foliate brackets from which cups were suspended on chains. Shell motif spouts on each side released water flow. The structure is surmounted with a chained orb terminal. The base is 2 ft wide, basin is 2 ft 9” wide and the height of the structure is 4’ 9”. Candeias which literally means oil lamps was originally a small village within the city of Campo Belo. Drinking water was transported by hand from local streams, and when numerous requests to the city management for a supply of drinking water were ignored a group of local politicians initiated diversion of water into a water box and from there through pipes into the village. Taps to access the water flow were later installed in the square and surrounding streets. 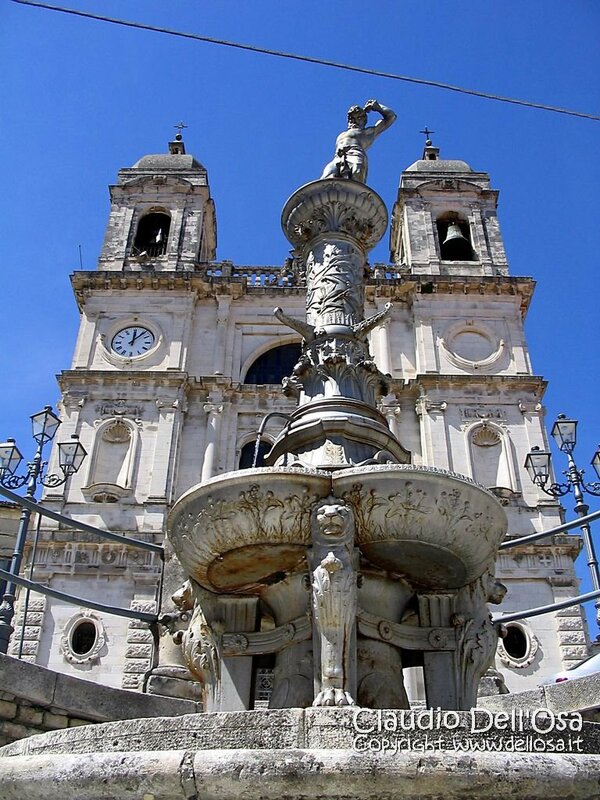 In celebration of the village’s successful project without the assistance of Campo Belo city management, and to commemorate the strength of their commitment, a drinking fountain was purchased surmounted with a statue of Samson, a symbol of strength. The village people accessed this clean water source using cans and buckets often carried on their heads. The drinking fountain is located on Avenue Dezessete de Dezembro in the gardens known as Monsignor Castro Square. Design number 19 was advertised by Walter Macfarlane & Co. to be used as a standalone fountain or placed under a canopy structure. Manufactured by the Saracen Foundry in Glasgow, the 10’ 10” structure is seated on a two tiered octagonal plinth. It has a wide base with canted corners supporting a circular shaft ornamented with water lilies. Four lion jambs supported four highly decorated quatrefoil basins (one of the lion jambs is currently missing). The stanchion and central column are decorated with floral relief and projecting acanthus. Four consoles protruding from the column originally suspended drinking cups on chains. The capital supported the finial, a statue of Samson. The cast iron drinking fountain located at the base of the staircase leading to the church of San Valentino and Damiano is seated on a two tiered circular stone plinth. The date of its installation is unknown. The structure which was restored in 1989 is design number 19 by Walter Macfarlane & Co., advertised as a standalone fountain or for placement under a canopy structure. Manufactured by the Saracen Foundry in Glasgow, the 10’ 10” structure has a wide base with canted corners supporting a circular shaft ornamented with water lilies. Four lion jambs support four highly decorated quatrefoil basins. The stanchion and central column are decorated with floral relief and projecting acanthus. Four consoles protruding from the column offered suspended drinking cups on chains. The capital supports the finial, a statue of Samson with a drape tied at his waist, breaking free of the ties which bind his wrists. The square plinth upon which the statue stands is inscribed with name Samson and Walter MacFarlane & Co. Glasgow.